Wondering what has happened to condo \ townhouse values in the North Lake Tahoe – Truckee area for 2017? Is the time right to buy, or sell a condominium or townhome in North Lake Tahoe – Truckee, California area? The North Lake Tahoe – Truckee real estate market conditions continue to improve. Inventory levels are the lowest in more than a decade, and prices have moved up again, a benefit for sellers, a negative for buyers hoping for a small market price correction. Tahoe area condo Buyers have had fewer choices, and for those looking for a condo for sale in North Lake Tahoe, or Truckee area under $400,000 will find their options are very limited these days. As an example of how limited the selection of lower-priced condos\townhouses are as of 02-18-2018 there were only six (6) condos for sale in the greater North Lake Tahoe area (North Shore, West Shore, Greater Tahoe City area) under $500,000 and one of those listings had an occupancy restriction. Things are not better in the greater Truckee area (includes the Donner Summit, Soda Springs area), there were only thirteen (13) condos/townhouses for sale under $500,000 in this area, leaving lower-priced buyers with very few buying options. In the ski resort areas like Alpine Meadows and Squaw Valley there are a few more options, but not many. You can see that the over-all North Lake Tahoe – Truckee condo/townhome price trend is moving up, which means lower priced units are becoming harder to find. North Lake Tahoe – Truckee regional condo/townhome prices are up +12.7% for 2017 when compared to 2016, with a median average sales price of $422,500. Historically, our available condo/townhome for sale inventory levels are at their lowest during our winter months (first 3-4 months of the calendar year), then levels begin to rise as new inventory comes on the market in anticipation of the spring/summer selling season. The exception to this is an increase in the inventory levels around the ski resorts, where this type of property shines during the winter season. For the entire area we continue to have extremely low condo/townhouse inventory levels that will continue to keep prices up. At the lower price points North Lake Tahoe – Truckee area home Buyers are often facing multiple offer situations on properties that are priced correctly for their location, features, and condition. The listed price to sold price average for the median average sales price in North Lake Tahoe – Truckee area for 2017 year was 97.9 %. Unlike the single family home market at 99.7%, there is some wiggle room on condos/townhomes in our market, but it is still a very strong sellers market. The lack of inventory and limited selection in so many condo developments will continue to put pricing pressure on buyers. Buyers need to be prepared to move quickly and they need to be prepared to make a decision right away. Buyers also need to be prepared to make an offer at, or above listed price for newly listed properties. The days on market (DOM) has also dropped approximately -13.7%, from 117 DOM in 2016 to 101 DOM for 2017. *YTD period is 01/01/2017 – 12/31/2017. Data Source: Tahoe Sierra Multiple Listing Service (TSMLS). Year-to-date summaries are based on information from the Tahoe Sierra Board of Realtors (TSMLS). Due to TSMLS reporting methods and allowable reporting policy, this data is only informational and may not be completely accurate. Therefore, Laura Allen, or Coldwell Banker Residential Brokerage does not guarantee the data’s accuracy. Data maintained by the TSMLS’s may not reflect all real estate activity in the market. All information is deemed to be reliable, but is subject to change, modification, and/or correction without prior notice. If your property is currently listed for sale, or you have an active Buyer Representation Agreement, this is not intended as a solicitation. 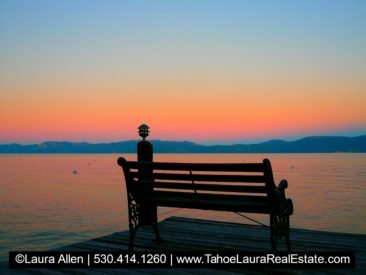 Even though the North Lake Tahoe – Truckee area has seen prices move up, Buyers seeking the Tahoe lifestyle are still finding our area very desirable. 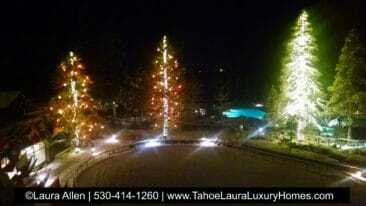 Currently we have some of the most impressive North Lake Tahoe luxury condos and Truckee luxury properties on the market. If you are thinking about a single family home, the demand for luxury mountain homes in the North Lake Tahoe – Truckee area continues to be very strong. The North Lake Tahoe, California area covers the North Shore: Tahoe City, Carnelian Bay, Tahoe Vista, and Kings Beach, along withe the West Shore: Tahoe City, Homewood, Tahoma, Meeks Bay, and Rubicon Bay covering over twenty (20+) plus miles of Lake Tahoe Shoreline. Moving north we pick up Alpine Meadows, Olympic Valley, Northstar and the greater Truckee area. The North Lake Tahoe – Truckee area is dominated by second home owners, which means the full-time population in these areas is much lower than other communities around the Lake Tahoe Basin area. 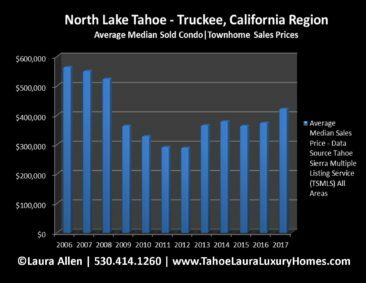 If you are a current home owner in the North Lake Tahoe – Truckee area you may want to know what your North Lake Tahoe – Truckee home is worth today. As a home owner if you’re asking yourself this question, and you want to know your current value, just click on the link below. You will be asked to provide us with some information on your Tahoe property and we will get you a complete home market valuation report. We know that each North Lake Tahoe – Truckee property is unique and that it was built as a custom home, or cabin, and not part of a massive standard built subdivision, and that’s important as we calculate your current property value. It is important that your mountain property gets all of the credit and value it deserves for all of those special features before we place a value on it, so it is not a computer generated value, but rather a current value based on your property condition, configuration and the comparable recent sales in your neighborhood. Want to know what happened in the single family market? North Lake Tahoe – Truckee Home Values | Market Report – 2017, click here!